Winner Affiliates have developed proprietary mobile marketing tools that will help you immediately monetize your mobile traffic. 1. over 90% of affiliates/websites do not operate mobile friendly websites, displaying the same content which may not apply to mobile users. 2. 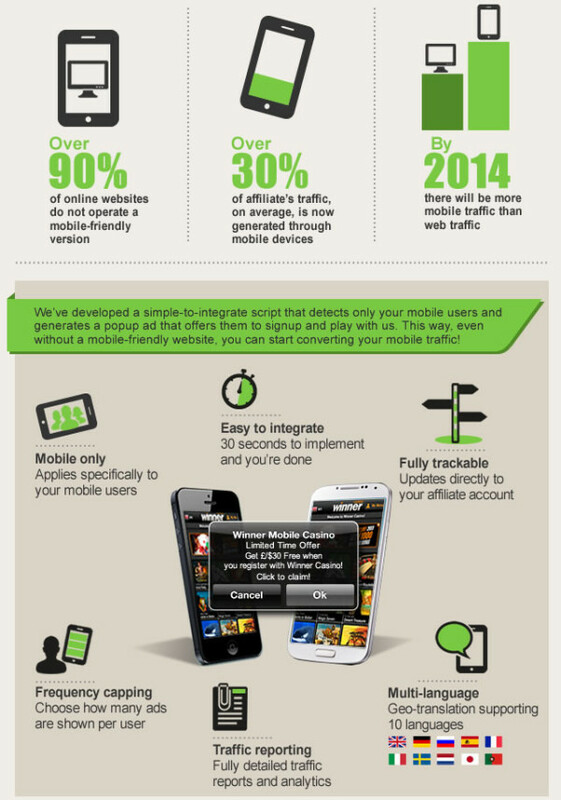 Organic affiliates are now seeing over 30% of their traffic generated through mobile devices. 3. Developing and Designing a proper mobile site is costly. To do a proper mobile site, meaning supporting the majority of screen sizes and resolutions. 4. 50% of the clicks on mobile banners are accidental (try to swipe, click a banner instead..).